Who’s the hairy geek about 2 minutes in on the BBC report, though? And welcome to anyone who heard me on PM on Radio 4 this evening – please note that comments are moderated on this blog, but I’ll get to them as soon as I get home from London! A senior manager at lottery operator Camelot has discovered that adopting different online identities is not as straightforward as it might appear, and it seems to have cost her her job. The contract to run the UK national lottery comes up for renewal in 2009, and Camelot is obviously very interested in the competition. The students in my online journalism class at City University this year must be wondering whether they have made the right choice. Getting a professional qualification in journalism, with its shorthand classes, endless lectures on ethics and numerous assignments designed to hone students’ reporting skills, may well look like too much effort in the world of citizen journalism. 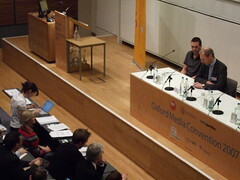 Ed Richards has just finished talking at the Oxford Media Convention and is taking some questions – including the obvious one from a Daily Telegraph journalist, which he will almost certainly kick into touch. 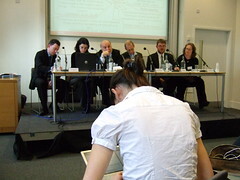 It was, as always with the patrician Mr Richards, a carefully judged, eloquently delivered and cleverly constructed speech, one which could be read as reassuring the entrenched interests in broadcasting while also outlining a view of the future which, if it comes to pass, will almost certainly mean their current business models are redundant. One of the more persistent founding myths around the internet is that it was designed to be able to withstand a nuclear war, built by the US military to ensure that even after the bombs had fallen there would still be communications between surviving military bases. A business user who forgot the password for their account on the corporate network would probably get a withering look from the IT department as they grovelled to have it reset, but it seems that young people who forget their MySpace logins are just as likely to make a new account as fret over their lost friends or painstakingly constructed homepage decorations.